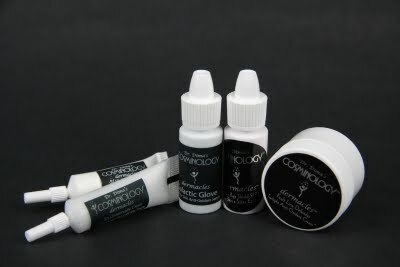 Review: Dr. Dima's Cosminology Corrector and Color Corrector - Cherry Colors - Cosmetics Heaven! 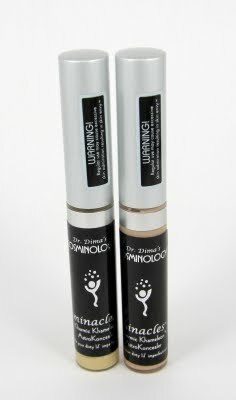 Today I will be reviewing two products by Dr. Dima's Cosminology. 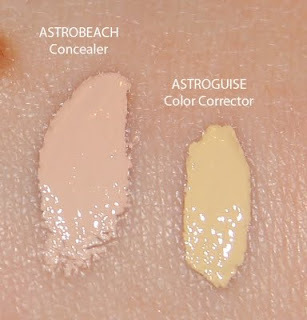 One is a color corrector AstroGuise and the other is a concealer/corrector AstroBeach. Both are used for undereye circles, but can also be used on the face to hide and correct blemishes or discolorations or for contouring. They have wonderful names: Kharmic Khameleon AstroKoncealer “hide your dirty lil’imperfections” AstroGuise and Kharmic KhameleonAstro Koncealer “hide your dirty lil’imperfections” AstroBeach. 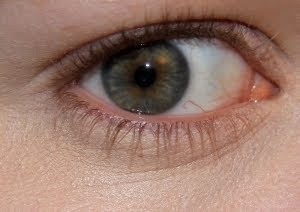 I have tried lots of correctors for eye circles, most of were are too light, so they offered no coverage at all. After actually giving up on them, I got these two concealers to try, and see if they could work for me. Said that, I must say I was a little sceptical at first, because on their site they have the most amazing picture ever! It's a woman's eyes; one is bare so you can see her under eyes circles, and on the other side the corrector has been used, and it looks absolutely great! And you know what? They did work for me. Package: The correctors come in a nice classy package, with as much as 8g of product! You know how much is that? That's so much product, that it will take you lots of time to use it up. And when I say lots, I mean lots, because with them, a tiny amount of products goes a long long way. I have them in two colors, AstroGuise and AstroBeach. AstroGuise & AstroBeach do: *Provide natural sunscreen activity *Lighten dark areas *Evens out skin tone *Erases spots First, let me show you my under eye circles in all their glory. 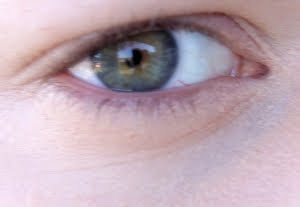 Now, some of you may say that mine are just too small or not relevant enough, to call them eye circles. But let me prove you wrong. 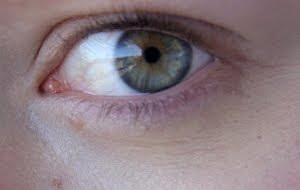 They are always there, they never go away, and I cannot stand the sight of them, because they make me look sick. It's like a dark shadow that's constantly there... So yes, they are eye circles. I took pictures in natural light and in artificial light, for a better comparison. ut because I normally don't go around without any foundation, or colored face cream, I decided to show you how this product would look on me every day. Under colored cream (BB cream in this case). The coverage is actually pretty good, the blue spots aren't visible in real life. But if you'd want to go full coverage, I'd advise you to use a little bit of corrector over the foundation instead under it. I have tried the AstroGuise (color corrector) over some red zones, and it worked surprisingly well. It covered the redness so well, that I couldn't even tell where the redness was! +The correctors come in various shades, so everyone can find the right corrector for its complexion! +You get a lot of product for a cheap price. +The quality is really good, it's thick so it will show on your skin! +It looks really natural on skin. 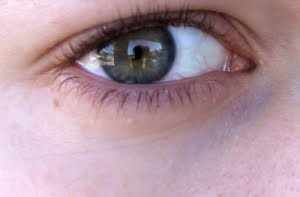 +They stay on for the whole day, and don't make the wrinkles more visible after hours of wear, as some other concealers do. +Really easy to work with, blends nicely. - If you apply too much product at once in one spot, your wrinkles will show up, but using it moderately it will give you a nice natural effect. Thinking about how much product you get for the price, and about its quality, I think I've got my new HG (holy grail product). I love love love love love love it! I truly almost gave up on under eye concealers, but thankfully I found this product. 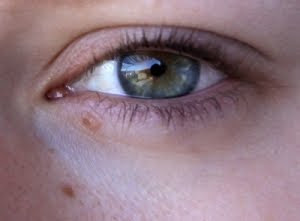 Now I will not have to photoshop anyone under eye circles anymore!For me it does work, I use the AstroBeach as an under eye circle concealer, and AstroBeach for decoloring before AstroBeach, or just to cover red spots on the face. I would recommend it to anyone who wants to cover their dark under eyes shadows. I'm not leaving my house without it, and I'm not exaggerating. I'm just THAT impressed! 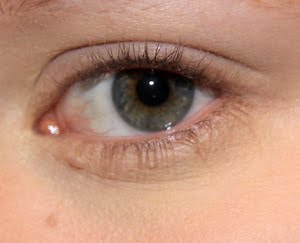 Sometimes just a swipe of concealer can make you look more awake, and fresh in a matter of a second! Now, let me tell you a little secret, okay? Are you ready...? This is Dermacles "Try Me! kit"! If you will be purchasing anything from their site, and you mention me (cherrycolors), you will get one all for yourself. It contains: Global Debris Remover Get Cosmically Naked™ (not pictured) So Universally Clean You Can Eat Off My Face™ Big Bang Those Light Years Away Hi-Plutonic C Daylight Anti-Oxidant Cream™ Cosmic Ray Sheild SPF36 Your Skin's Solar Eclipse™ Galactic Glove Seal Your Skin Anti-Oxidant Serum™ Fault-Line Defender Twilight Anti-Oxidant Cream™ Now, isn't that just super great?! I think it is, because these goodies all smell wonderful and as far as I read, they are little wonders in a box. But wait, there's another thing. They are having a nice offer for winter. If you purchase their Galactic Glove (75$), and you enter the coupon code winter09 you will get 10% off it! That is one big deal!